The other day I packed up the Muddy Kids and headed to Baradine! It was where it was all at! 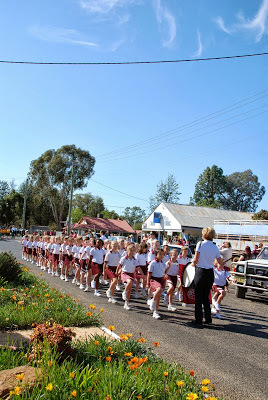 The annual Ring Trophy Carnival between the Catholic Schools from neighbouring towns, this is where they all come together, they have competitive marching down the main street, then a war cry competition and then the fun begins with races and relays, tunnel ball, captain ball, tug-o-war and then the novelty races. It is a great day, by the end of it I was busted and so were my 4 little people, just walking around the oval soaking it all in seemed to exhaust the young ones. Let alone my Muddy Organiser who marched and war-cried and played her little heart out. It was a proud Mum day as I watched her march so focused and go in the three legged race with her bestie, not caring who won, only that they worked together to stay upright. I know there will be lots, lots more of these over the years, but I think each one will be just as heart warming and as exhausting! 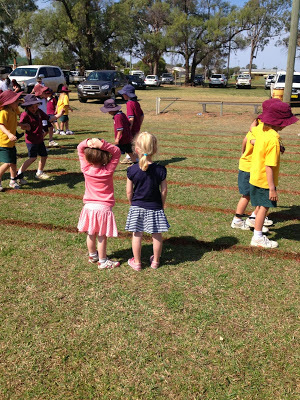 This entry was posted in Muddy Organiser, Photos, School on September 23, 2013 by nat.